Every homeowner who wants to move has four different ways to go about it, and choosing to become a landlord is one that seems to be the default decision for those that fail in their attempts to first get the home sold. For many it can be a wise decision, allowing them to turn a problem into a long-term investment vehicle. But for those homeowners who think they are going to rent out their home for a year or two and have their problems go away, a rude awakening looms in their future. The purpose of today's post is to encourage homeowners who are planning on renting out their homes to do a thorough analysis before making the decision. All other options are merely subsets of those listed above, and most homeowners would be wise to consider the ramifications of each choice. It has been my experience that most homeowners who really do not have to move end up staying in the home until their situation changes. For most, this is a wise decision. But for those homeowners who must move due to a major life change (new job, new family member, marital change, etc. 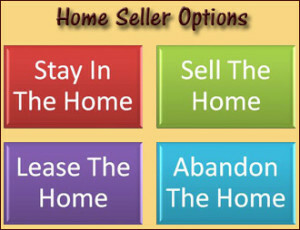 ), staying in the home is not really an option. They must make a choice on how they plan on getting rid of the home. Historically, we would look at the fourth option (abandoning the home) for a very small minority of all homeowners, but times have changed. Considering that a third of the market is still involved in a distressed sale of some type, abandoning the home is still an option for many. In fact, if you are upside down in your home and absolutely must move, it is likely that some method of abandoning the home will be the smartest financial move you can make. But for the majority of homeowners who are in a position that requires them to move, the decision will come down to selling the home versus leasing it out to somebody else. Many homeowners who try to sell their home and fail assume that their only option is to become a landlord. In other words, after the home doesn't fail, the only option remaining is to lease it out to somebody else. This is not only a faulty conclusion, it is also a decision that most end up regretting. They figure they can rent it out to somebody else for a year or two, then the market will move higher, and they can sell the home later. But there are some major hidden problems they do not see, and this is why their decision is flawed. Nobody will treat your home as well as you do; so expect to have to spend money on getting it ready to sell in the future - At a minimum, you can expect to replace the flooring and many appliances, as well at repaint the insides of the house. This costs several thousands of dollars and thus will require you to own the home for a longer period of time to recapture these costs. Do you really think you can lease the home out to somebody for a year or two, then spend several thousand dollars to sell it and come out making a profit? Perfect tenants are rare, expect vacancy, collection losses, and legal fees - What happens when the tenant moves in and stops paying rent? Do you really think you'll be the lucky landlord that get's the perfect tenant? What if they damage appliances, put holes in the wall, steal your ac units? While this sounds extreme, any investor will tell you that it happens at times. If you sell your home (in the future) to an investor, expect to get about 20% less than you would get from an owner-occupant - This is the major whammy in the group. Once you turn your home into a rental property, you give certain rights to the tenant. That means if you try to sell the home in the middle of the lease term, the new owner (who buys it from you) has to honor the terms of the lease. Thus, it is likely that you will only attract other investors to your home if you try to sell it during the term of the lease. Investors buy for profit, so they typically pay less than somebody buying to occupy the home as their residence. So if you wait for the end of the lease to sell your home, are you prepared to spend thousands of dollars to get it ready to sell, and then leave it vacant for half a year so the buyer can occupy it at closing? Expect your carrying costs on the property to move higher - Your property taxes will go up when you move out (once you lose your homestead exemption), and insurance for a rental property is not cheap either. Any expense that your require the tenant to make becomes a risk of loss in value. For example, what if the tenant is responsible for cleaning and maintaining a pool, what if they don't? How about the yard? If they let the yard go to seed, who is losing value? You are! Additionally, the amount of money you can expect to receive in rent is market-driven; make sure you understand supply and demand for home rentals similar to yours. When faced with a tough decision, many of us simply choose not to decide ... and of course, this is a decision in itself. Don't be the homeowner who ends up leasing out a property simply because it did not sell. Seek counsel! Owning a rental property is a fine solution for some people, but for many it is a costly mistake that takes years to resolve. Take the time to speak with a real estate expert in your local housing market when faced with a tough decision on your home, as there likely is a better way to go. If you would like help in deciding whether or not to become a landlord in Tallahassee, just drop me a note and we can schedule a time to review your situation and help you make the best decision. Home Sellers, Is It Time To Raise Your Asking Price?